Students Ashleigh Johnson, Lydia Byrd, Mariada Kaci, Bradley Charlesworth and Shannon Shaw in Barnsley town centre. 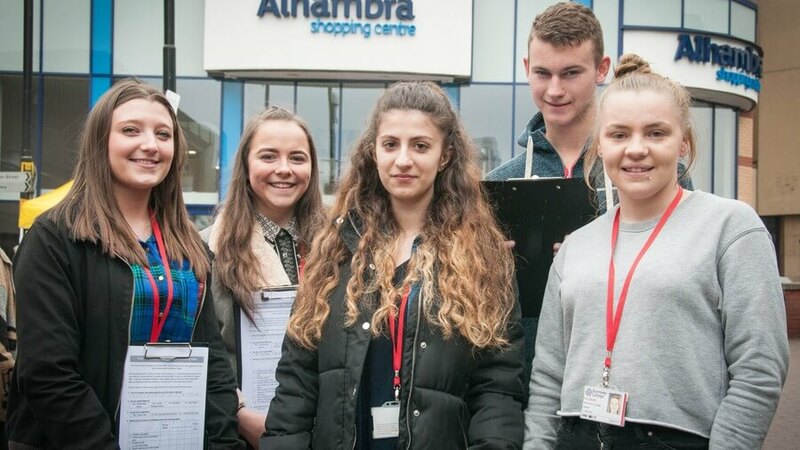 Our Childcare students have carried out surveys in Barnsley town centre to ask residents for their opinions on smoke free zones. Members of the public answered questionnaires created by the students on how children can be protected from taking up smoking and public outdoor areas being designated as smoke free. The students are assisting work by Barnsley Council towards its pledge to inspire a smoke free generation by 2025. This has involved them learning about social norms and how situations and role models influence people’s choices and decisions. As part of its Breathe 2025 pledge to inspire a smoke free generation by 2025, the council has requested that adults choose not to smoke in key public areas where children are present. This year has seen the launch of smoke free play parks and the council is now working with schools on the project and with Barnsley Hospital to improve their smoke free grounds. The smoke free town centre zones will support this work and make a significant contribution to changing the environments in which children and young people spend their time.